Alright here's my 2nd wallpaper submission, another simple one 'cuz hey that's the kind of wallpapers I do ;p.
Alright I drew the picture, it originally came from my sketchbook. I decided to do the background in the popular artist (on deviantart)'s style-->QueenofDorks. She does tons of stuff with those cloudy like things..and they seemed fun to do and looked cute with the Octopus. Alright that's all I have to say..soo moo. art & wp (c.) Kristina Ruvinova/Kimiko-chan (me). P.S. Some of you had questions about the texture in the background. The reason I put that texture there is because this image originally came from my sketchbook, and I thought that the traditional and digital art clashed together too much so I took a chunk from my sketchbook (I had sketched the background in the original image blue so that explains the blue lol) and put it in the background like so ^. I liked the way this version looked alot better then the clashy traditional and digital one, I know if I had posted that version I probably would've gotten more comments on how it looks too weird with the traditional art. Yum, a cute wallpaper with a soft color scheme to along with it. The originality and clean-cut drawing is just a fun thing to have on your desktop. This is really good for a second wallpaper... you're off to a great start kristina! Proposed by kuroimisa and highlighted by bromithia. 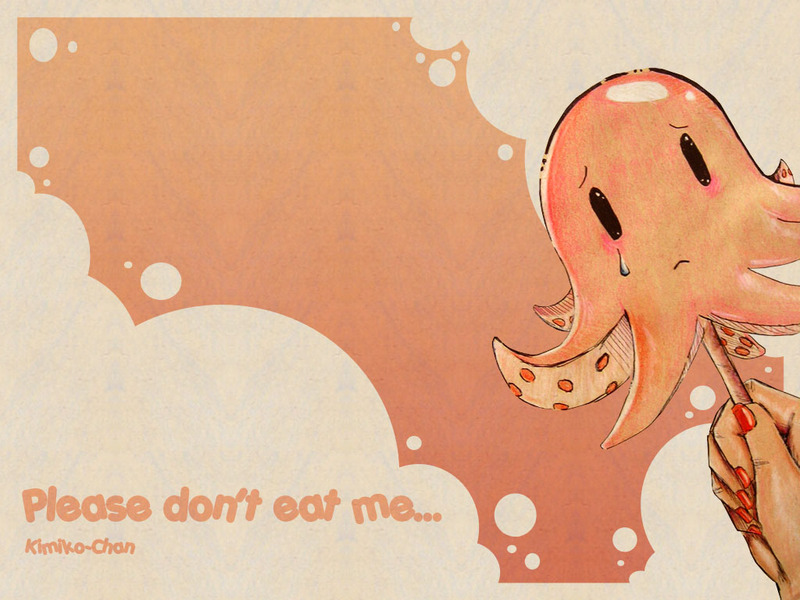 aww poor mr. octopus, this is aburrrrrrrrrrrrrrrr cute >_<, mr. octy is adorable!, I love the colors you used in this wallie!, reall cool! That is absolutely cute XD! The textures are so funky and I love the idea of this whole thing! I especially like how it looks still coloured with pencil. A funny and cute one ;) I like it. And the tear drop on its face. :D I'd never thought that I would see such a lovely wallpaper. It's way too cute to be eaten ^_^""
I didn't know that you draw this sweetie yourself when i saw this wallie for the first time. Nice simple bg + good textures. Everything fits together very well. And i just love this guuuy ! Hope she didn't eat this cute little octupus :( ? hahahah...what an amusing wallpaper! I really like the idea! I can see why this has been highlighted. Great job and keep it up! I like the warm colors in this wallpaper... and it's cute! Gah, will I ever be able to look at my bento again?! hahah, this is an eye-catcher. very, very cute well the little octopus is already skewered so there's nothing to do huh? *teary eyed* poor sea animals i shall save you. Nice wallie. it will be wierder if the octopus was smiling hahahah. wow that was a big orange walls,i like it! tako? looooool funny wall thanx! As someone else put it, very original idea -- and it looks great. You mentioned it's 'simplicity' above, but I really do think that sometimes simplicity is harder to pull off than what some might percieve as complex as you've got to really organize, make sure the composition of the subject is sound, etc. and you've got nothing to hide behind. You pulled it off.